Wait a Minute, Lustig. The Threat of Fructophobia. And the Opportunity. — Spiros Focás in Jewel of the Nile. Sugar is an easy target. These days, if you say “sugar” people think of Pop-Tarts® or Twinkies®, rather than pears in red wine or tamagoyaki the traditional sweet omelet that is a staple in Bento Boxes. Pop-Tarts® and Twinkies® are especially good targets because, in addition to sugar (or high fructose corn syrup (HFCS), they also have what is now called solid fat (the USDA thinks that “saturated” is too big a word for the average American ) and the American Heart Association and other health agencies are still down on solid fat. Here’s a question, though: if you look on the ingredients list for Twinkies®, what is the first ingredient, the one in largest amount? (Answer at the end of this post). What went wrong in the obesity epidemic? There is some agreement that by focussing on fat, the nutritional establishment gave people license to over-consume carbohydrates. The new threat is that by focusing now on fructose, the AHA and USDA and other organizations are giving implicit license to over-consume starch — almost guaranteed since these agencies are still down on fat and protein. The additional threat is that by creating an environment of fructophobia, the only research on fructose that will be funded are studies at high levels of total carbohydrate where, because of the close interaction between glucose and fructose, deleterious effects are sure to be found. The results will be generalized to all conditions. Like lipophobia, there will be no null hypothesis. 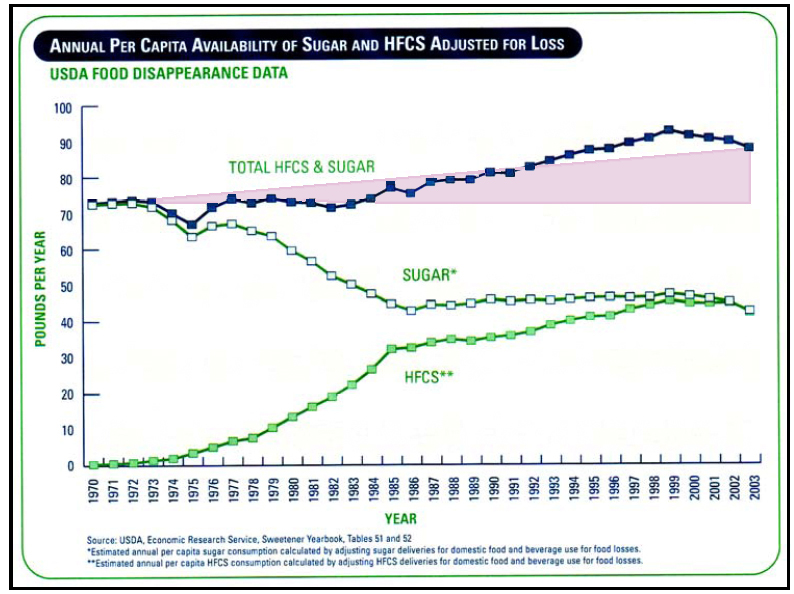 The latest attack on sugar and on fructose itself (sugar and HFCS are half fructose) comes from Robert Lustig, a pediatrician at University of California San Francisco. His lecture describing fructose as a virtual poison got more than a million and a half hits on YouTube. The presentation has an eponymous style (Lustig, Ger. adj., merry, amusing, e.g. Die Lustige Witwe, The Merry Widow) and includes a discussion of the science bearing on fructose metabolism. While admitting the limitations of that science, even Gary Taubes was worried. Comments on YouTube and other sites say they liked the science but did not agree with his recommendations — it will turn out that he now wants government control of sugar consumption, especially for my kid and yours. The presentation of the science is compelling but, while it has a number of important points, it is clearly biased and, oddly, a good deal of it is totally wrong, some of it containing elementary errors in chemistry that border on the bizarre — how hard would it have been to open an elementary organic chemistry text? In trying to draw parallels between alcohol and fructose, Lustig says “ethanol is a carbohydrate.” Ethanol is not a carbohydrate. A horse is not a dog. If you said that ethanol is a carbohydrate in sophomore Organic Chemistry, you would get it wrong. Period. No partial credit. Such elementary errors compromise the message and raise the question in what way Lustig is an expert in this field. It gets worse. It is biological function that is important and ethanol is not processed like fructose as Lustig says. There is very little chemical sense in saying that ethanol and fructose are processed biologically in similar ways. And a metabolic pathway is shown in which glycogen is absent. Glycogen is the storage form of glucose and is generally taken as a good thing because of its relation to endurance in athletes but, like fat, glycogen is a storage form of energy and having a lot is not always a good thing. In any case, it is not true that fructose does not give rise to glycogen. In fact, fructose is generally better at forming glycogen than glucose is. This is especially true when you consider the effect of exercise which is why Gatorade® may actually be a good thing if you are in a football game rather than watching one. This is the general error in Lustig’s talk. Metabolism is not static and has evolved to deal with changing conditions of diet and environment. A metabolic chart, like any map only tells you where you can go, not whether you go there. And the notable absence in Lustig’s talk is data. It is possible that sugar and ethanol have behavioral effects in common but this is not due to similarities in metabolism. And even the behavioral effects are not settled within the psychology community; alcoholism is far different from “sugar addiction,” if there is such a thing; polishing off the whole container of Häagen-Dazs® may not technically qualify as addictive behavior. All of this might be okay — Lustig’s lecture was not a scientific treatise — except that he has gone to the next step. Convinced of the correctness of his analysis, he wants government intervention to control sugar and sweeteners in some way . There is an obvious sense of deja-vu as another expert attempts to use the American population as Guinea pigs for a massive population experiment, like the low fat fiasco under which we still suffer. 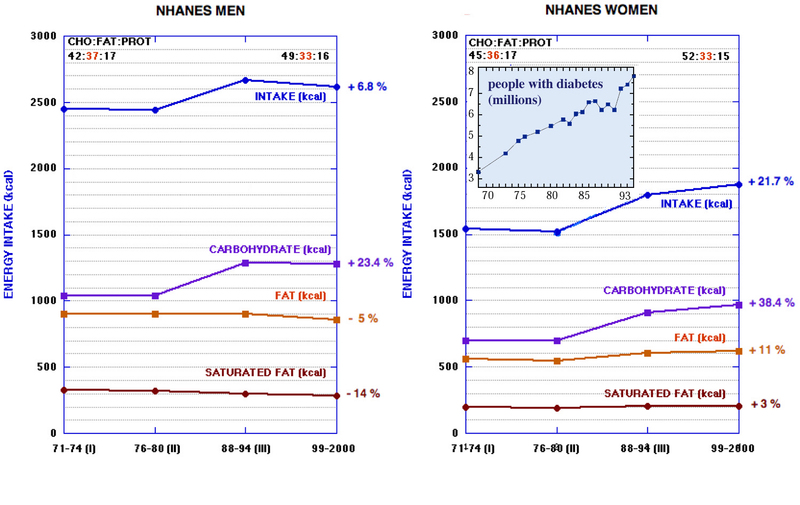 It is not just that we got unintended consequences (think margarine and trans-fats) but rather that numerous people have pointed out that the science was never there for low-fat to begin with (brilliantly explained in Fat Head). In other words leaving aside the question of when we should turn science into policy, is the science any good? It is important to understand that fructose is not a toxin. It is a normal metabolite. If nothing else, your body makes a certain amount of fructose. Fructose, not music (the food of love), is the preferred fuel of sperm cells. Fructose formed in the eye can be a risk but its cause is generally very high glucose. Fructose is a carbohydrate and is metabolized in ways similar to, if different in detail, from glucose but a substantial amount (can be 60 %) of fructose is turned to glucose — that is why the glycemic index of fructose is 20 and not zero. The extent to which fructose metabolism has a uniquely detrimental effect is strongly dependent on conditions. Fructose may be worse than glucose under conditions of very high carbohydrate intake but its effect will change as total carbohydrate is lowered. And since carbohydrate across the board is what is understood to be the problem — Lustig states that clearly in his YouTube — policy would suggest that that is the first line of attack on health — reduce carbohydrate (emphasizing fructose if you like) but as carbohydrate and calories are reduced, any effect of fructose will be minimized. In the extreme, if you are on a very low carbohydrate diet, any fructose you do eat is likely to be turned into glucose. Lustig makes his case against fructose in terms of fundamental biochemistry which is really how it should be. Can biochemistry be explained to the general population? Can the problem be explained in a simple but precise way so that we really have the sense of talking about science and not politics? So what is needed is somebody who actually knows biochemistry. Maybe somebody with experience in teaching biochemistry to future doctors. Hey, that’s my job description. In fact, I’m going to try that in the next few blogs and on YouTube. I and others have taught courses that try to reduce the three year sequence that professional chemists follow: general chemistry-organic chemistry-biochemistry. I will try to give everybody a window into organic chemistry, biochemistry and metabolism. In fact, that might be a good focus for government intervention. Instead of punishing the patient, how about funding for teaching biochemistry to the public. For the moment, though, let’s look at some population data. What about sweeteners? Well, of course, consumption has gone up. Surprisingly, not as much as one would have thought. According to the USDA about 15 %. One question is whether this increase is disproportionately due to fructose. 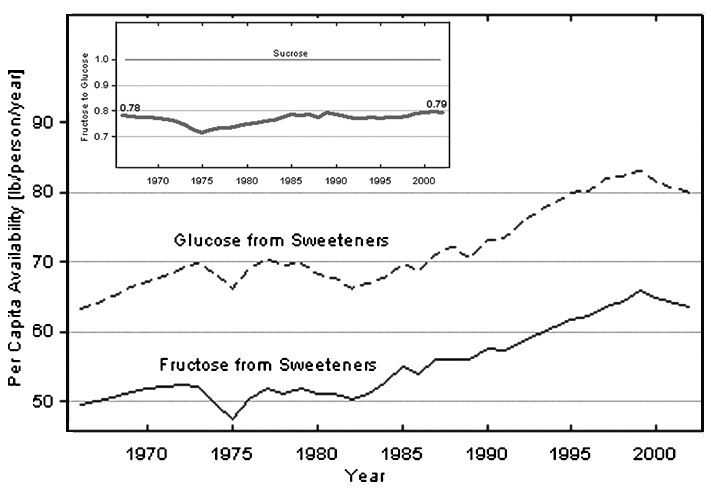 The figures below show that, in fact, the ratio of fructose to glucose has remained constant over the last 40 years. (The deviation from 1:1 which would be expected for pure sucrose or HFCSA, is due to a relatively constant 20 % or so of pure glucose that is used in sweetening in the food industry). It is possible that, although the ratio is the same, that the absolute increase in fructose has a worse effect than the increased glucose but, of course, you would have to prove it. The figures suggest, however, that you will have to be careful in determining whether the effect of increased sweetener is due to fructose or glucose, or the effect of one on the other, or the effect of insulin and other hormones on both. An unrestrained, lustige, lack of anything careful is exactly the current threat. Answer to “puzzler:” The main ingredient in Pop-Tarts® and Twinkies® is flour. Some people say that if you add up the different forms of sugar that will be greater but like all ideas derived from Lustig, there is an advantage in looking at the data: 38 g. of carbohydrate, 17 g. of sugars.